After what was a great break in the Lakes, we took a couple of days rest. 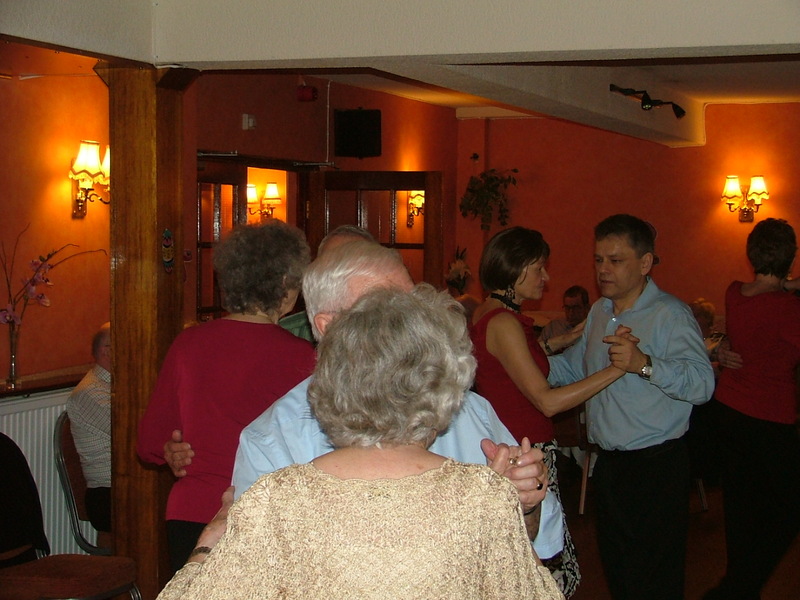 This gave us a chance to pop down to Upton Magna for their saturday milonga. It was however a bit on the run as we had only just driven back and had barely unpacked. Still we got some tango in. We did give a bit of a demo at the goodbye party, so we had actually tangoed two nights on the run. Ok we rehearsed the day before so we had tangoed three nights on the run. But to be fair we only really danced with each other. I can heartily recommend HF Holidays at Monk Coniston, the food was superb, the room with a view was almost out of this world, and the guides were knowledgable and friendly. It was a joy to be in a house of Beatrix Potter and to explore the walled garden just like Peter Rabbit. All things must come to an end though and we were now back home again. We rested a couple of days and were ready for the off again; this time we planned to walk The Sandstone Trail backwards. Well what can I say, it all went well except for a few blisters and my annoyance that we could not find budget accommodation anywhere. It is little wonder people no longer holiday at home, for the price of my three nights away I could have had a fortnight in Benidorm. Still we achieved what we wanted; covered a quarter of the distance of the camino and climbed more mountains than we would ever see there, so I was happy. Now we had done all this, it was time for some tango. As luck would have it my break coincided with the Rudolfo y Miho weekend in Wilmslow. Saturday night we attended the Milonga and had a great time. I have to thank DJ John Tan for some wonderful music. He also introduced me to some D’Arienzo milongas that I did not know, these are now in my list. It is good to find another DJ who really understands what being a tango DJ is all about. We had a good night in the Premier Inn as well. There was a live singer in there when we returned. A few drinks with friends, a raucous group at the bar and Bob does Modern Jive(untrained), all created a great night. No idea what time we got to bed, but we were all up again in time for a hearty breakfast. Sunday and we went to the social colgadas workshop. Rudolfo will never teach anything you cannot do in a Milonga, but in this case I think he taught something we can never do! but we will keep trying. So there was just our Monday practica and then it is back to work again for Bob. Still this is the last break I will have officially, but I suspect with my rundown to retirement there may be times when I have so many free days we may get away again. I know I can appear forthright at times, and often end up apologising for my words; this has happened a lot lately, twice in one night in fact. The first time was for something I said here. While I stand by what I said at the time, I readily accept that I took the coward’s way out by saying it here and not face to face at the time. I had to do some grovelling to overcome the situation, but thankfully tango people in general are quite big about these things and hopefully I am forgiven. The second time was something I said on the night, it did not come out as I had intended and I never noticed “the look”. Again I had to go back and apologise, grovel some more and beg forgiveness. Those who know me realise I am not qualified to be in the diplomatic corps and hopefully realise that mostly I mean well if occasionally it comes out all wrong. We had a happy return to Wilmslow this week. I have missed Atilla and her style of teaching and the friendly crowd here. It is hard to describe how welcome I was made to feel as woman after woman lined up to dance with me. Despite the time that has passed the prodigal was more than welcomed by both the teacher and the alumni. Viv had brought some shoes that had already been purchased and she just wanted to pass them on, but this did not stop queues forming to look at them. Viv hardly had chance to dance, it is quite unbelievable the effect shoes have on women. In fact as we were leaving somebody said something about shoes and suddenly there was another crowd all eager to view. There was a good selection of cake and chocolate and it took all my will power (and Viv’s nagging) to stop me completely destroying my diet. They do a “cake dance here” a bit like a birthday dance but for the bringer’s of cake, not fully understanding what was happening, because firstly there were two cake bringer’s and because somebody said “snowball” I caused chaos and for a while there were four couples on the floor. Fortunately they sorted themselves out when the lunatic had left the floor. So Viv was happy and so was I, I even managed to keep the cost of fuel to an acceptable level by driving more slowly. Hopefully this will be the first of many returns, if I can stop myself upsetting too many people, that is. You may wonder what a weekend spent with a crowd of Ballroom and sequence dancers has to do with tango, and on the face of it you would be right. Go to any Club de Barrio in Buenos Aires and it will be populated with people who can remember the war, people who having had a full and long working life are not ready to just sit down and put their feet up. My generation and often those much younger is full of people who are just too tired for life, want nothing more than to sit and be entertained by the TV. So when I had the chance to spend a weekend with people who possess more life force and energy than your average ninja turtle, of course I jumped at it. The whole weekend at The Queens Hotel Llandudno was organised by Steve Sound and we were glad to help out. It gave Viv a further opportunity to sell some more shoes and me a chance to hone my DJ skills. Of course there are those who say this is not proper dancing, but when I first started it was all I could get without travelling halfway across the globe. I am not making excuses here, I still enjoy it, just as in the tango scene there are women who will wait all night just for one dance. They are grateful and always when I dance with them they make me feel king of the hill. My dance journey has taken me on many routes and I do not regret a single one of them and refuse to accept that anyone who bothers to get out and take life by the horns instead of sitting at home having entertainment done to them is doing something that is not quite the real thing. So as we arrived in The Queens Hotel and tried to settle in Viv spoke to one of our ladies about her shoes. Unknown to us there was to be that afternoon a Tea dance downstairs and the lady who runs it was sitting listening in, she came over and invited us to display in her dance. Not wishing to miss a selling opportunity Viv willingly agreed. So I have just had a weekend of improper dancing, and I thoroughly enjoyed it. Right now I am quite knackered, we were up until well after midnight every night putting the gear away, then up at eight for breakfast. No time to rest preparing the afternoon dance and it’s too fuzzy to remember what else, but hey it was fun, and if you can see how close this is to what goes on in the city of tango, accept it and go with the flow then you can come along and enjoy the ride with me. Hopefully we will be in Wilmslow this Thursday as Andreas and Genoveva will be teaching there, I have not seen them since Salon Canning when their class was disturbed by my phone and problems buying my apartment. I am sure they will be as keen to hear how things went as we will be to hear about their twins. Often we see people trying to do show tango at a milonga, I have often been known to have a good rant about it. Now some may say that I am anti and that I only have time for salon. In some ways this may be true, but I am happy to watch good show tango, if it is well led and in the appropriate place. On Saturday night the Finches ventured out once more to Wilmslow to meet old friends as well as the Shrewsbury rent a mob. (yes I know, but I am sticking with the name). The milonga was in full swing when we arrived and the crew were holding the line of dance manfully. Once the greetings were over it was time to dance. I had already lost Viv but in my attempts to find her I just kept getting involved with more and more “how you doings?” and “are you still dancings?” I did get that dance and was soon whisking as many women as I could off to the floor. The nuevos and high kickers had not yet arrived or were not brave enough to invade the line of dance. We had a guest singer from Buenos Aires, to my shame I cannot remember his name, and by the time we left I had completely forgotten to pick up one of his CD’s. His singing was great and the guitar playing was truly awesome. Atilla told us he had been playing for fifty years (must have been born with a guitar in his hands). On thing I need to make clear here is, I said “his music was challenging” this was in no way saying that anything was wrong with it, tango cancion by it’s very nature is intended to be sung and to listened to, as such it is difficult to dance to. At one time I would not have even tried, but now if I enjoy the music I find it is worth the effort. In the middle of one of his sessions he did a Chacarera, I stood in the middle of the floor looking for someone anyone; thankfully I was joined by one lady who I did not know (thanks) and another couple. We did one set but got lost towards the end, everyone was relying on me (big mistake), still we enjoyed it and the audience seemed to appreciate it. So it could not have been too bad, I will have to practice more with Janis next time I am in Buenos Aires. Ricardo and Jenny are here for a full weekend of workshops, of course this coincides with my work pattern so that the only time I could be here is for the Saturday night milonga. I don’t think either of them remembered us, funny when you think that they came over and greeted us in Salon Canning two years ago. They must meet thousands of people so I will not hold it against them (me, worst person in the world for remembering people). They had just married and now two years later they still looked happy together. When they danced in the salon they moved beautifully but understated, even when Ricardo danced with some of our high kickers they were kept in check. In the middle of the evening they did a demo, now was a chance to let it all fly out, high kicks, ganchos, volcadas all came into the frame. Now of course they danced Show Tango, this was the right place for it, and they proved that just because they can do it does not mean they should, like the good dancers that they are, they saved it for were it is best appreciated. In the salon they could just as easily do big stuff, after all they were the guests of honour, nobody would say a thing, but they did not, they know the etiquette, they know how to behave. It is just a shame that some others do not. Later in the night the Nuevo lot gradually got more confident, the line of dance broke down and I got my share of kicks. Some people can go to the best teachers, see, but never learn. Unknown to me Viv had had enough and was ready to go, but I just kept on dancing. So when I noticed her with her coat and shoes on, I had to make a hasty departure, so I left without buying a CD and without saying goodbye to Atilla. It was a shame after such a good night that I never thanked her, hopefully so many others did that she did not miss me. Pressure of work is delaying my posts, so let me apologise for the lateness of my posting before I start. There are a number of posts due but they must wait until I have time. The drive to Pant is mainly large straight roads, the first part dual carriageway until we join the A5. This section past Gobowen and Oswestry is where the A453 and A5 are the same road, and as such is usually heavily trafficked. I was not in a hurry, we had left in good time and I was free to enjoy the trip even though we had travelled this way earlier in the day when we had danced in the street. After Oswestry the A5 splits away and the A483 becomes a more picturesque country road. Pant is only about three miles further on, an old English village with fine old houses hanging precariously from the hillside, next to more modern abodes that have been built with little regard to cost. A modern single story community centre sits to the left of the road next to an old fashioned red telephone box and opposite the well stocked village shop. In the foyer is a memorial to the war dead that makes the place look more like a cemetery, but the place is otherwise bright and welcoming. From the windows you can look out to the hill opposite where someone has carved owls and other statues out of old trees. Sharon was busy preparing the room when we arrived, we were early and able to help sort the food, fill the tea urn and set the tables. Others were arriving while we were busy and all waded in to help. Sharon still had to man the desk as people were arriving and wanted to pay, so I was surprised to hear some familiar voices from the front. I peered out through the hatch and there at the desk was Atilla our old teacher (old as in from the past not aged) and Margret one of my favourite partners from Wilmslow. They soon came to help in the kitchen, always a favourite spot, and we had a chance to catch up on old times. Margret is now helping with the class, and she tells us has finally persuaded her husband to take up tango. I was glad of this news for two reasons; firstly we always need more leaders, but purely selfishly I did not want to loose Margret, as we loose so many women because there husbands got fed up of them being out every night on there own. The next tanda I determined to dance with Atilla. I have an irrational fear of dancing with her, I suppose because she was teacher for so long and I feel all the time that I must be doing something wrong. I need not worry she knows the place for teaching is not the milonga and would never pull me up while on the dance floor, but still my insecurity makes me worry. Atilla accepted my invitation graciously and stood up as I came to her table. She is of Chinese origin. Although she has the look she is very tall and stands well over me even without her heels. Early thirties about six foot slim and elegant, she is striking and cannot enter anywhere unobserved, even when she is not known, but here she is known as the best tango teacher in the northwest and I know if I lead anything and she does not follow it is my fault. We dance a wonderful tanda (well for me, I cannot speak for her) but soon it is over, and I congratulate myself on overcoming my foolish fears. Next I chose Margret, she also is very tall, I have never understood why the best men are short and fat while the best women are tall and slim, maybe it is just my perception. Flowing shoulder length brown hair, slim with an ever present warm smile, we dance off across the floor. Very soon though she is complaining, It seems that she can hardly stand the floor is too slippery. She is happier after scraping her shoes and we finish the tanda with a flourish. As the night wore on I hardly sat down, I of course returned to my wife often, why again not many men chose to dance with her I do not know, but I had too many women with whom I had to dance. I suspect I smelled like an old tramp by the end, I was sweating so much but no one complained. When we finally left the kitchen was full, so we were able to leave the domestics to others this time. I was exhausted but happy and thankful to have danced again with some old friends, and appreciative that they had travelled so far for us. Atilla asked if we would be at any of her weekends, but unfortunately all of them are on weekends when I am working, such is the life of a frustrated Milonguero. We may yet meet again in the winter though, heres hoping.